What would complement Meyer Lemon Mezcal Cocktail , Spiced Cranberry Vodka or Pomegranate Limoncello Cocktail? These herbed goat cheese stuffed dates. 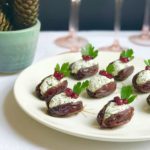 Overstuffed with homemade herbed cheese to temper the sweetness of dates, and decorated with red and green, these one or two bite appetizers are sure to be a holiday hit with your friends and family. Make-ahead elements include the herbed cheese itself, the pomegranate seed picking and the pretty parsley leaves, resting in moist toweling until ready for decorating. With a little notice, you simply split the dates, nestle the cheese and apply the festive garnish. The assembled appetizer can be made in full the day before and stored in your fridge, but after more than one day the dates become laden with moisture. The herbed cheese will last in your fridge up to 4 days; how easy is that? I love easy. Using local goat cheese, like this fabulously tangy Sandy Bottom chèvre from Bonnyclabber Cheese of Sullivan’s Pond Farm, is a great way to support local. The best dates are those with pits. One easy step of making a lengthwise slit and removing the pit will assure the most plump, most moist dates for this appetizer (pitted dates are a little dry for my taste). You can now purchase pomegranate seeds (arils) in cute cups at your grocers, eliminating that step of peeling and picking. If Italian parsley is not available, a tiny sprig of rosemary will look just as cheerful. Herbed goat cheese may be made and chilled up to 4 days in advance : in small bowl, use spoon or heavy spatula to mix together cheeses, garlic, salt and pepper and herbs. Chill at least one hour so easy to handle. 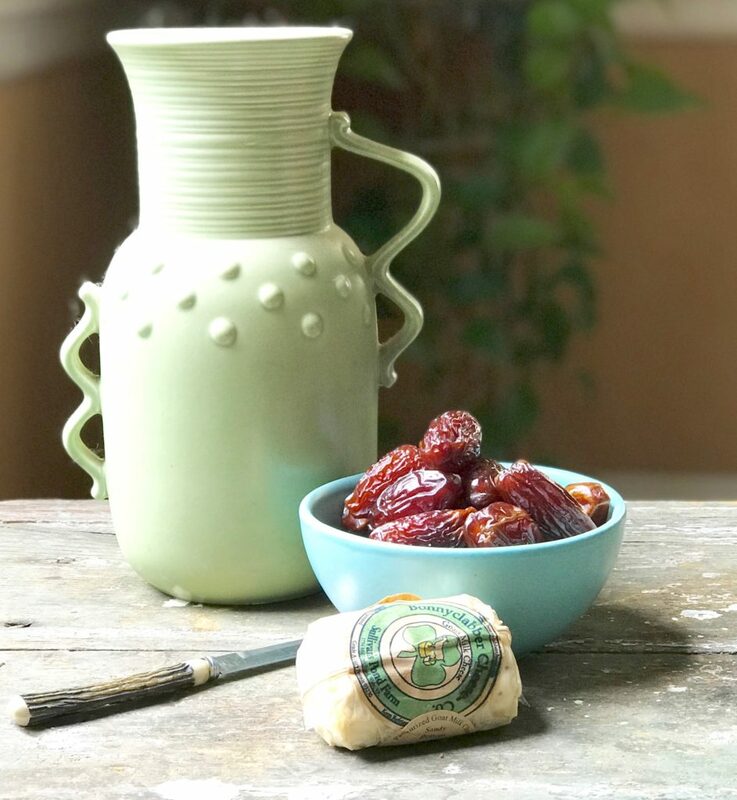 Have a moist towel nearby as you stuff the dates (some of the cheese mixture will stick to your hands and the dates will look a little messy – wipe often!). Scoop about one tablespoon herbed goat cheese per date and fill the cavity; smooth over the top with your fingers. If desired, garnish each with several pomegranate seeds and a parsley leaf. Finished dates will keep in the fridge up to one day – longer means soggy dates, so best do-ahead advice is to make the cheese ahead and stuff the dates just prior to serving.